Tesco beef any good? Asda stuff is god aweful. Morrisons, Sainsbury's or Waitrose are better for supermarket meat IMO. Best stuff is from a Butchers in Oldhurst ~ no good for anyone not living/working in the area though. £5.98 /kg is £1.50 too much. Wait for a better offer. 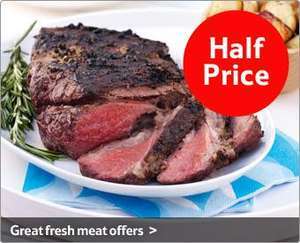 £5.98 /kg is £1.50 too much.Wait for a better offer. Nope, not in my experience. i always go to morissons now. I, like you, am full of awe that Asda can sell such consistantly poor produce. The last 2 beef joints i've bought there, i've taken back. Tough as old boots. Their bakery is c##p as well. Morissons have their own abattoirs and can then be very strict about the grade of cattle that they buy. Their beef is usually very good. I, like you, am full of awe that Asda can sell such consistantly poor … I, like you, am full of awe that Asda can sell such consistantly poor produce. The last 2 beef joints i've bought there, i've taken back. Tough as old boots. Their bakery is c##p as well. You cooked them then took them back? Didn't asda have something to say about you method of cooking? Your never going to be able to slow roast and get beef looking like the photo in the post. good op,time to feed up for winter! Best stuff is from a Butchers in Oldhurst ~ no good for anyone not … Best stuff is from a Butchers in Oldhurst ~ no good for anyone not living/working in the area though. Having Johnson's of Oldhurst about 2 miles away, I agree it is a fantastic butchers, but you of course pay for the privilege. I do trust Morrisons for both meat and fish though. I find Tesco ok for pork and chicken -- but their beef has always been a bit dodgy for me. Maybe I'm just unlucky? I just paid £14 per kilo for Tesco finest roasting beef. Better be worth it!!!! Any tips on cooking it within the next 2 hrs would be great please, it's 0.925 kg? Used to buy Iceland frozen beef joints at a fiver a time but for some strange reason they have stopped doing them and are now doing ostrich! what the hell?!! !